Boat is located in Concord,CA.Please contact the owner @ 925-451-6325.. Completely Restored as new by a local craftsman. Molded Plywood Hull in Mahogany with finished natural wood sides and deck. Has a walk through twin passenger compartment deck with controls and steering forward. The boat is stored in climate controlled Aircraft Hangar and is raised on a hydraulic lift for storage. Detailed photos available upon request from an interested party. Could take several days to process. The boat is the best one I have ever seen. Restoration about 7 years ago, and never used. Stored in Climate controlled aircraft hangar on an auto lift. Could take a few days to get the boat down to be photographed. The original owner lavished many options when purchased. 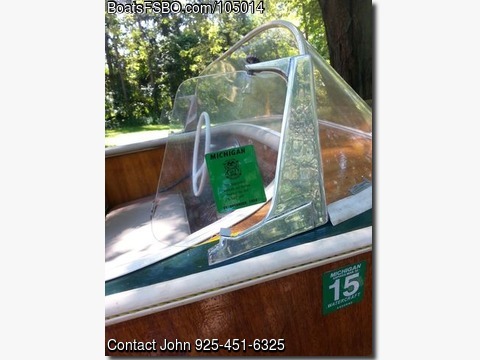 It has the factory windshield and the Mercury Quicksilver steering system, new for that year, A push-pull type single cable rather than the spool type dual cable rope common during the period. Also the new Mercury Marc 55e Engine. Power tested for 1400 continuous running miles with the only requirement being oil and gas. And is rated at 40HP. Quite adequate power for the 14 ft boat. The trailer was originally purchased with the Boat and is in very good condition and has received regular servicing.